Drivers are not fond of ice and snow. Sure, it looks pretty from the inside of our warm residences. However, once you drive or park your car in those conditions, the pleasure greatly decreases. Basically, your car is at risk from anything that’s frozen. In the winter, it’s snowy or icy roads that haven’t been properly plowed or treated. In the spring and summer, the risk comes from something even more dangerous — hail. Hail is comprised of irregular balls of ice. During strong storms, winds in the upper atmosphere can sweep rain droplets into colder areas. This is where they freeze into ice pellets. As more droplets attach themselves to the pellet it becomes a hailstone. It falls to the ground at the point it gets too heavy for the atmosphere to maintain. When enough of these hailstones get together, the end result is a hail storm. How much damage your vehicle incurs depends on the size of the stones. If they are around the size of a dime, then the damage is minimal or none at all. It’s when they reach the size of a quarter that your vehicles exterior surfaces can be damaged. Dents can form in your roof and hood even after a few seconds of quarter-sized hail. Prolonged exposure may result in damage to the front windshield and back window. If the storm continues, those areas may be weakened to the point they shatter. 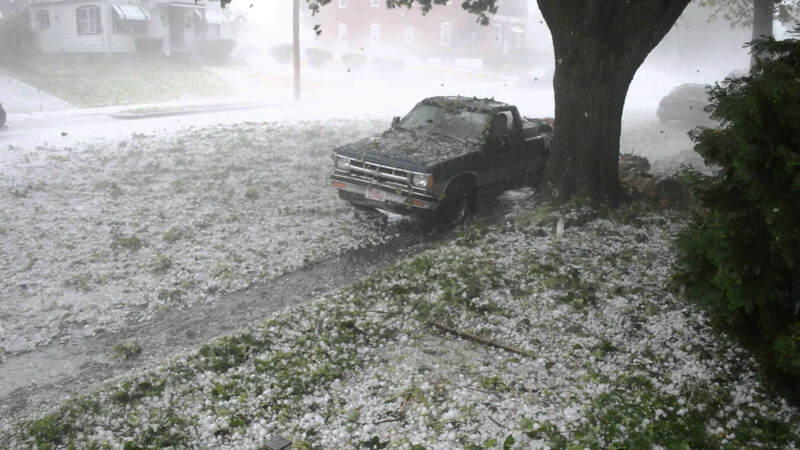 Most major insurance companies cover hail damage. In most cases, they’ll be prepared for your call if others in the area start reporting the same issues. The claim process is similar to the one you would use in a car-on-car accident. You would file a claim. Next, an adjuster would come out to determine the extent of the damage. From there, they would suggest a company like Jewell Collision or ask you to choose one of your own for repairs. In conclusion, be pro-active. Confirm with your insurance company if you have that coverage.